The touch screen digitiser flexible printed circuit ribbon connector is a surface mounted component located on the iPad 2 logic board and allows connection of the touch screen digitiser cable. This part can be easily damaged if care is not taken when removing the screen assembly from the iPad 2 logic board. When performing touchscreen repairs or general repairs that require disconnecting the touch screen from the logic board, it is easy to damage the clips or the actual gold plated pins. Let our skilled technicians perform this difficult repair for you, restoring touch screen functionality. The parts we use in our repair are original parts. * Our normal repair turnaround times are 3 - 10 working days. We always aim to complete repairs as fast as possible. 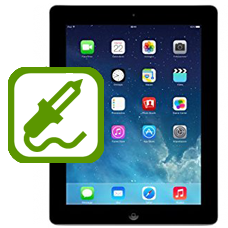 This is an in-house Apple iPad 2 repair service, when ordering this service you are required to ship your iPad into our repair centre for works to be undertaken. You will be sent shipping details once your order has been processed.